Social media marketing is a mainstay of business today. No matter how stupid you believe tweeting and pinning and liking are, in the end there is a tremendous value to being present online WHEREVER your customers and prospects are. Used to be business dictated how people found out about them and how they were projected in advertising and the media. You bought an ad, placed a yellow page listing or had a write up in the newspaper that you basically controlled. Today, consumers are out there talking about you and your brand, searching the internet to find out what your company is all about and making buying decisions based on what they find. Yesterday we had a business owner call to say that there were bad comments out there on a website and he wanted to know what one thing he could do to make that go away. Unfortunately there is no one thing. There are ten spots on google every time someone does a search and he will need to fill those up with LinkedIn listings, website and blog listings, Facebook and Google Plus profiles, YouTube videos and all other manner of data about his company in order to battle that. So what if no one is talking bad about your company. You are okay with sticking your head in the sand and ignoring social media right? Hmmmm no! Having one website that was supposed to carry the load for your entire marketing efforts may have worked in 2003, but today, you need to be visible across a wide range of media. Your customers all have a favorite and if you aren’t on there, your competitors will be attracting their attention before they even get around to searching for your products or services! So now you know why you need it, why can’t you just hire someone in house to do your social media marketing? That way you can look over their shoulder and manage everything internally. Here are my Top 10 reasons for why this is a very bad idea! 1. It is cost prohibitive to get someone that is good. 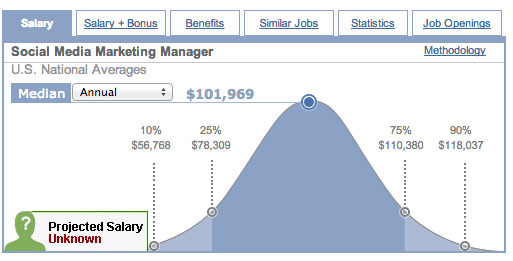 The AVERAGE salary for a social media marketing manager according to Salary.com is $101,969 a year. This does not include benefits that anyone decent will require. 2. The benefits package for this employee will be another expense. 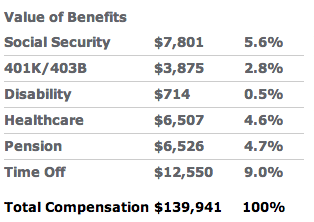 In addition to the salary requirements, you have another $12,550 to cover Social Security, retirement, healthcare, etc. 3. Getting someone with marketing experience. Social media marketing is not about social media, it is entirely about marketing. While learning the tools of how to accomplish the tasks is important, you would not hire a surgeon just because she had a good way with cutting her food. Knowing the company’s goals, what you want to accomplish and the best ways to do that are skills that are learned over the years. There are four hour courses that some of the so call “social media experts” take to learn the tools and then put themselves out there as gurus. Make sure to ask how long your in house employee has been doing marketing. 4. Staying current with the trends. Social media marketing and SEO are a moving target. You cannot learn something today and think that it will be the same in a year (or even the next two months). One glaring thing that comes to mind here is the practice of using posting services like Hootsuite. While there is a place for those, all you need to do is take a peek at your Facebook timeline to see that there are not nearly as many Hootsuite auto posts as there are real people who hand posted. 5. Keeping up with training. Another huge annual cost you will be bringing in house is training. Your employee will need to take courses and attend conferences and training events to stay current with the technologies. We spend between $6,000 and $10,000 annually in training for our employees and our marketing expert. The problem with spending this money on an employee is that all that know-how walks out the door if they leave. 6. A commitment to keeping jobs in America. One thing we do hear is that companies are sick of outsourcing US dollars overseas. This can make hiring a person for your company seem like a patriotic thing to do. 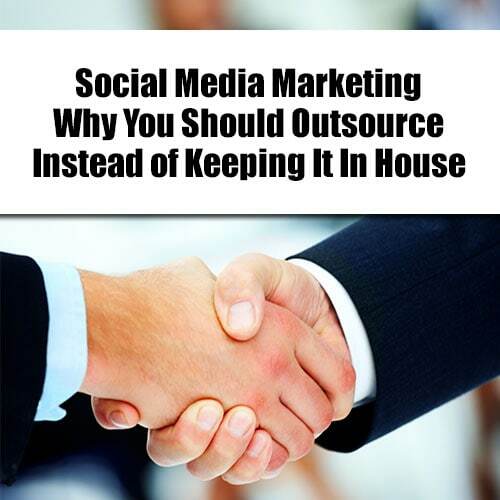 We agree whole heartedly and there are social media marketing companies who are not outsourcing work (we know, we are one of them!). Simply ask if their employees are in the US or if they employ overseas workers when you are doing your due diligence. 7. Lots of hands. If you have your social media in house and your employee becomes sick or unable to do their job, there is no one to step in and pick up the ball. When you outsource your work, the social media marketing company should have multiple employees who can step in and take over your posting at a moments notice. 8. No animosity. Another big problem we find is that employees who are leaving or getting ready to leave on bad terms have sometimes tampered with or otherwise disrupted marketing channels before heading out the door. We have had more than one company contact us to see if there is a “secret” to getting their Facebook page back after a disgruntled employee has changed passwords or deleted pages. When you are working with an outside company, their workers are do not have any “skin in the game” to hurt your company. In fact, we hire all “seasoned” women who are proud of the job they do and who have never stepped a toe over the line without asking first. 9. Time and consistency. We have worked with a number of big (and small) companies who have every intention of hiring a social media marketing manager to, well, do the social media tasks. What we have found is that this person rapidly becomes busy doing other company things and the focus on tweeting, answering messages and generally minding the social media store gets diluted. Having an outside company dedicated to this allows your marketing department to keep the goals and focus in mind while directing the outsourcing agency, but the work still gets done. 10. Doing what you do best. If your company is not a social media marketing company, then the focus of your business needs to stay on your industry and not get mired in the social media flavor of the day. Utilizing internal talent to be doing outward facing tasks is definitely not the highest and best use of their time. It is fine to have sales people working with specific prospects, but your company as a whole has to have a plan in place to take advantage of this huge (and multi-legged) marketing opportunity. Are we biased because we ARE a social media marketing company, probably! But I have to say that all of these are items that we have encountered in our work with companies and they are valid problems in this internet, social media based world. Previous Post: « Real Estate Marketing – Should You Use WiseAgent, Top Producer or InfusionSoft?